When you think of Red Bull, who do you associate it with? Athletes? Students cramming for an exam? Club-goers? If you answered yes to any or all of the above, congrats- you just figured out Red Bull’s marketing strategy. As Rob Waker explains in “Buying In,” Red Bull figured out how to use the aspect of “murky” to its advatnage. Unlike a lot of other brands that define their brand image with a particular target demographic in mind, Red Bull caters to a murky demographic, where “being embraced by extreme atheletes and clubgoers and gym rats and middle-class office workers and computer gamers and break-dance fans is just fine- at worst, each group simply thinks that Red Bull is something for them, partly because they have never been told otherwise” (Walker 155). Do other aspects of Red Bull’s marketing strategy generate “value terms” as well? Let’s take a look at an example I stumbled across recently. 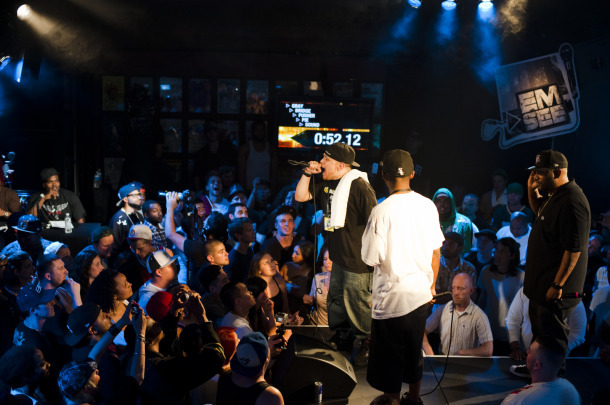 Called the “Red Bull EmSee 2011,” as described on their website,”Red Bull EmSee is an invitation-only MC battle series designed to find the best freestyle rappers in the country – giving them a national platform to showcase their skills”. The event stopped in eight cities, with the championship set to take place in November in Atlanta. What does the winner get? A trip to L.A. to record at the Red Bull Studios (*cough* another murkeing ploy) with a top producer. The event also has celebrity backing from Eminem and Bun B (fancy, fancy). 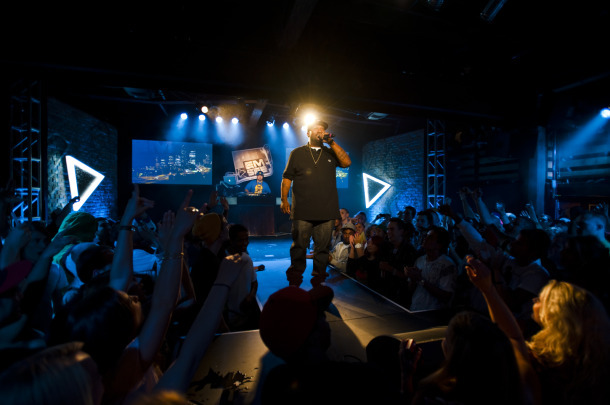 You might be wondering what Red Bull has to do with the practice of emcee-ing or hip hop culture in general. It doesn’t necessarily have anything to do with it at all. Sponsoring the event isn’t a way for Red Bull to define their product as an energy drink for hip hop fanatics. Instead, it seems to be a way for the company to gain “street cred” with yet another demographic who will assume the brand is meant for them. Looking at photos from the event below, I noticed something else interesting. While the company designed a logo for the event with the Red Bull logo on it (shown here), during the actual even when they reproduced the event logo on the stage, it just said “Emsee” instead of “Red Bull Emsee.” There is no visible brand image on the stage, in the club, or on anyone’s clothing. It seemed that other than the title of the event, the name Red Bull was absent. That seems like a pretty pricey endeavor to undertake if your brand logo isn’t going to be present. But it seems that this absence is just one way Red Bull better establishies its “street vibe” and appeals to the urban crowd rooted in values of authenticity. The event doesn’t seem like a corporate push (although it is). Yet, it does just enough to generate the “value terms” Mateschitz referred to. The press surrounding the events and the word-of-mouth value of the events generated by attendees are valuable results that wouldn’t be possible had Red Bull carried out a more traditional marketing campaign.